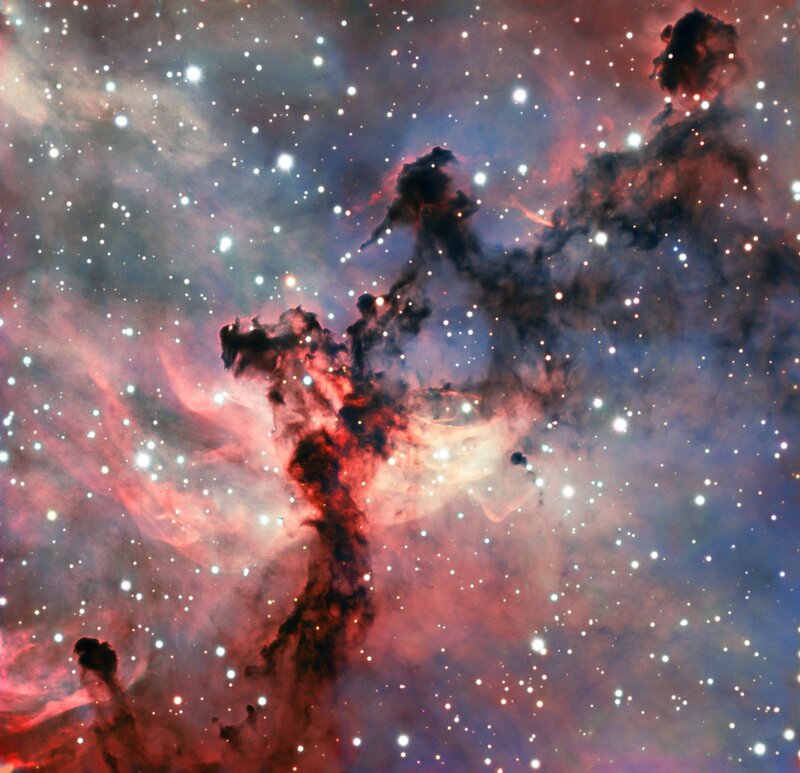 This particular image was obtained with the FORS 2 instrument on ESO’s Very Large Telescope (VLT), sited in the harsh environment of Chile’s Atacama Desert. FORS 2 is an extremely versatile instrument that can produce very high-quality images (like this one!). It is also a spectrograph that can split the light it collects into a rainbow of colours, giving astronomers information about the chemical composition of objects across the Universe. Star clusters are common structures throughout the Universe, each made up of hundreds of thousands of stars all bound together by gravity. This star-filled image, taken with the NASA/ESA Hubble Space Telescope’s Wide Field Camera 3 (WFC3), shows one of them: NGC 1866. NGC 1866 is found at the very edges of the Large Magellanic Cloud, a small galaxy located near to the Milky Way. The cluster was discovered in 1826 by Scottish astronomer James Dunlop, who catalogued thousands of stars and deep-sky objects during his career. However, NGC 1866 is no ordinary cluster. It is a surprisingly young globular cluster situated close enough to us that its stars can be studied individually — no mean feat given the mammoth distances involved in studying the cosmos! 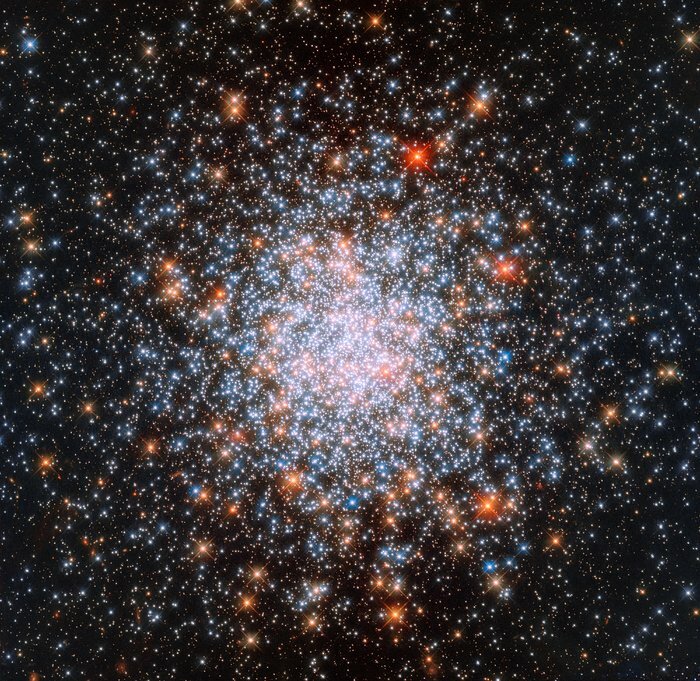 There is still debate over how globular clusters form, but observations such as this have revealed that most of their stars are old and have a low metallicity. In astronomy, ‘metals’ are any elements other than hydrogen and helium; since stars form heavier elements within their core as they carry out nuclear fusion throughout their lifetimes, a low metallicity indicates that a star is very old, as the material from which it formed was not enriched with many heavy elements. It’s possible that the stars within globular clusters are so old that they were actually some of the very first to form after the Big Bang. In the case of NGC 1866, though, not all stars are the same. Different populations, or generations, of stars are thought to coexist within the cluster. Once the first generation of stars formed, the cluster may have encountered a giant gas cloud that sparked a new wave of star formation and gave rise to a second, younger, generation of stars — explaining why it seems surprisingly youthful. Sh2-115 is the emission nebula in the centre and Abell 71 is the planetary nebula near the bottom right corner. And HD 196178 is the beautiful bright bluish star at 9 o'clock! As prominent at it looks in this image, it is not the source of ionization of Sh2-115 since it is too cool to be able to do that, at spectral class B9. It is still a blue star, though! 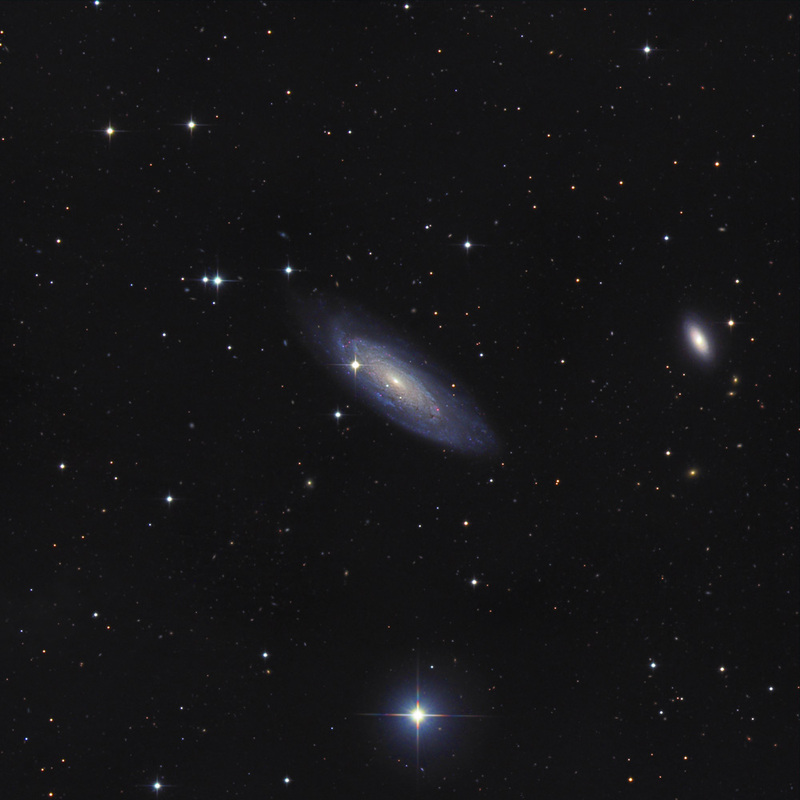 Adam Block has posted a new galaxy image! Yay! 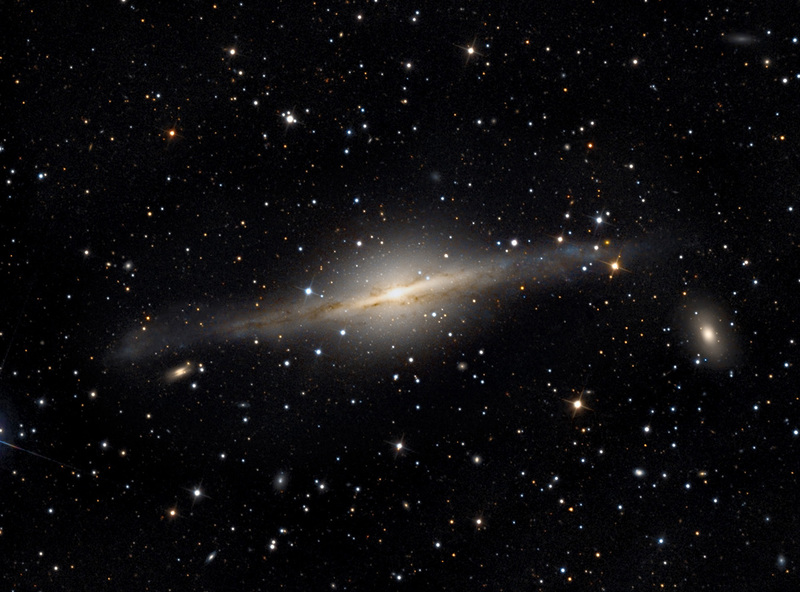 NGC 5084 is classified as an S0 galaxy or a lenticular galaxy, a galaxy that has a disk but no dust or star formation, and NGC 5084 looks pretty much the lenticular part, too. However, Adam Block's image makes it clear that there is dust, although small amounts of it, in the disk. 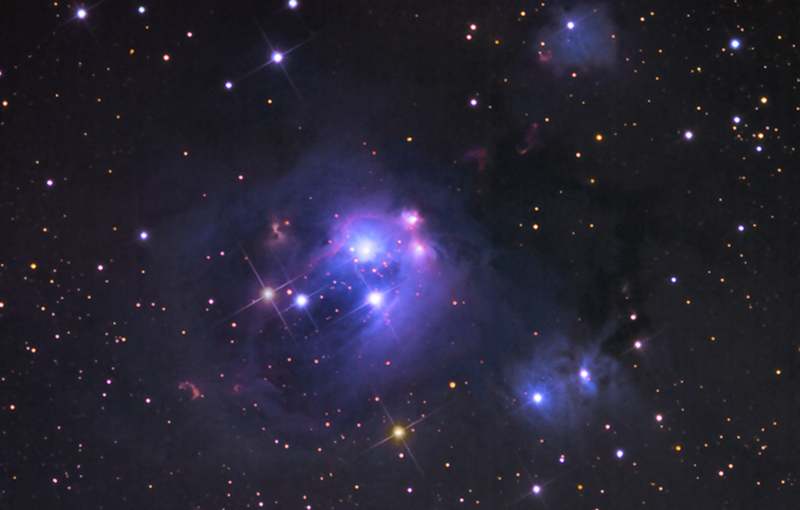 Also there are some young bluish stars in the disk, at about 3 o'clock. But the colors of NGC 5084 are very red. Its B-V index is 1.110, which is red indeed, since few nearby galaxies have a B-V index higher than 1.000. The U-B index of NGC 5084 is less spectacularly red, testifying to the presence of a few ultraviolet-bright stars. Please note the remarkably hamburger-shaped background galaxy at about 8 o'clock. 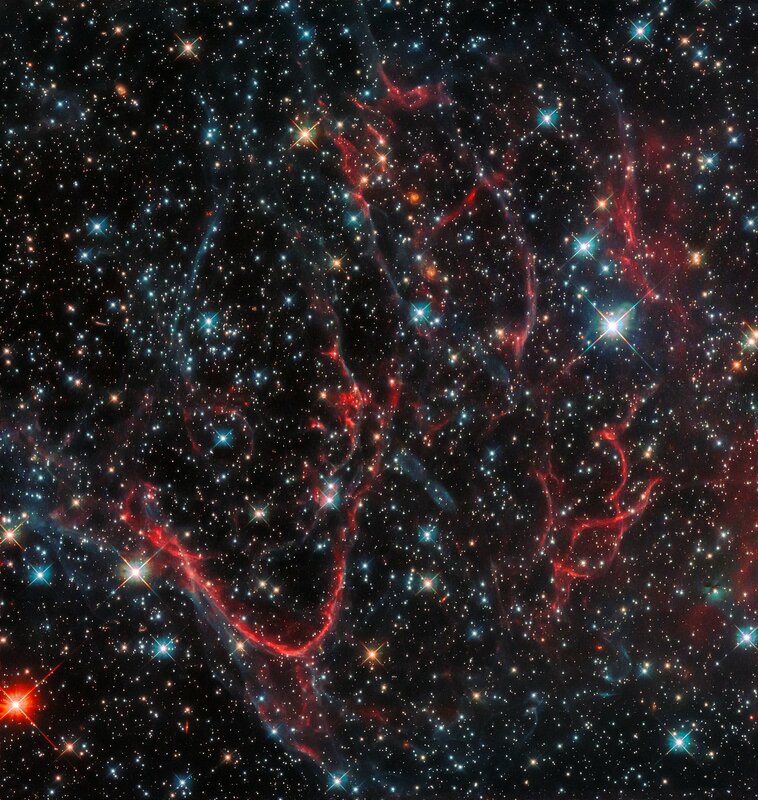 This dark, tangled web is an object named SNR 0454-67.2. It formed in a very violent fashion — it is a supernova remnant, created after a massive star ended its life in a cataclysmic explosion and threw its constituent material out into surrounding space. This created the messy formation we see in this NASA/ESA Hubble Space Telescope image, with threads of red snaking amidst dark, turbulent clouds. SNR 0454-67.2 is situated in the Large Magellanic Cloud, a dwarf spiral galaxy that lies close to the Milky Way. The remnant is likely the result of a Type Ia supernova explosion; this category of supernovae is formed from the death of a white dwarf star, which grows and grows by siphoning material from a stellar companion until it reaches a critical mass and then explodes. As they always form via a specific mechanism — when the white dwarf hits a particular mass — these explosions always have a well-known luminosity, and are thus used as markers (standard candles) for scientists to obtain and measure distances throughout the Universe. There needs to be a Hubble mosaic of the entire LMC! This planetary nebula is also known as WeDe 1.